If you find yourself facing intrusive Pushmeandtouchme.info pop-ups, ads, or notifications on your screen, then that’s a clear sign that your computer is infected with the malicious software from the ‘ad-supported’ software (also known as adware) family. Ad supported software is an undesired programs usually gets installed alongside free software, codecs and shareware. Aside from causing redirections, the adware also can open lots of popup advertisements, slow down the PC system and continually gather privacy data. So, we suggest you delete adware which causes unwanted Pushmeandtouchme.info pop ups ASAP. This will also prevent the adware from tracking your online activities. A full Pushmeandtouchme.info popups removal can be easily carried out using manual or automatic way listed below. There are a simple manual tutorial below which will assist you to delete Pushmeandtouchme.info pop-up ads from your Microsoft Windows machine. The most effective solution to remove this ad-supported software is to complete the manual removal tutorial and then use Zemana, MalwareBytes Anti Malware (MBAM) or HitmanPro automatic tools (all are free). The manual method will assist to weaken this adware and these malware removal tools will completely remove Pushmeandtouchme.info pop-up ads and return the Mozilla Firefox, Chrome, Microsoft Edge and Internet Explorer settings to default. If you perform exactly the steps below you should be able to get rid of the Pushmeandtouchme.info pop up advertisements from the Internet Explorer, MS Edge, Chrome and Mozilla Firefox browsers. First, you should try to identify and delete the application that causes the appearance of unwanted ads or browser redirect, using the ‘Uninstall a program’ which is located in the ‘Control panel’. The Internet Explorer reset is great if your web-browser is hijacked or you have unwanted addo-ons or toolbars on your web-browser, which installed by an malware. First, launch the Internet Explorer, then press ‘gear’ icon . It will display the Tools drop-down menu on the right part of the web browser, then press the “Internet Options” as shown in the following example. In the “Internet Options” screen, select the “Advanced” tab, then press the “Reset” button. The Internet Explorer will open the “Reset Internet Explorer settings” prompt. Further, click the “Delete personal settings” check box to select it. Next, click the “Reset” button like below. Once the process is finished, click “Close” button. Close the Internet Explorer and restart your personal computer for the changes to take effect. This step will help you to restore your browser’s search provider, home page and new tab page to default state. In this step we are going to show you how to reset Chrome settings. PUPs like the ad-supported software can make changes to your web browser settings, add toolbars and undesired addons. 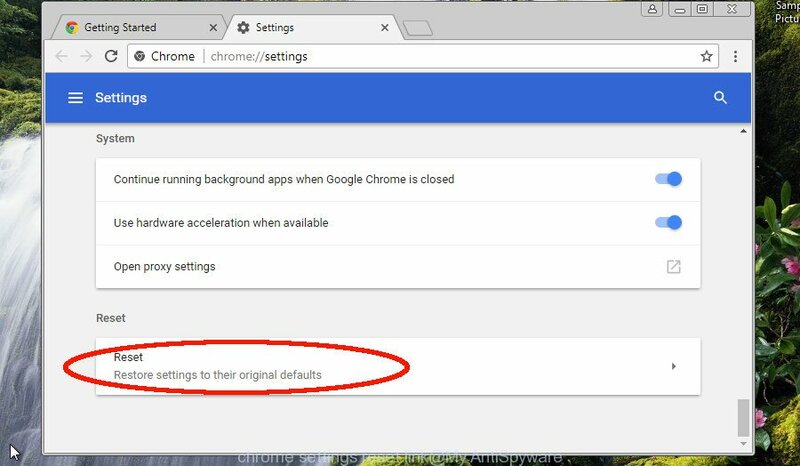 By resetting Google Chrome settings you will delete Pushmeandtouchme.info ads and reset unwanted changes caused by adware. Essential information like bookmarks, browsing history, passwords, cookies, auto-fill data and personal dictionaries will not be removed. It will show the Google Chrome menu. Select More Tools, then press Extensions. Carefully browse through the list of installed extensions. If the list has the addon signed with “Installed by enterprise policy” or “Installed by your administrator”, then complete the following guidance: Remove Google Chrome extensions installed by enterprise policy. You need to confirm your action, click the “Reset” button. The web browser will start the procedure of cleaning. After it’s finished, the web browser’s settings including newtab, search engine by default and startpage back to the values that have been when the Chrome was first installed on your machine. If the Firefox web-browser application is hijacked, then resetting its settings can help. The Reset feature is available on all modern version of Mozilla Firefox. A reset can fix many issues by restoring Mozilla Firefox settings like new tab, startpage and search provider by default to their default values. Essential information like bookmarks, browsing history, passwords, cookies, auto-fill data and personal dictionaries will not be removed. First, open the Mozilla Firefox and press button. It will show the drop-down menu on the right-part of the internet browser. Further, press the Help button ( ) as shown on the screen below. It will display the confirmation prompt. Further, click the “Refresh Firefox” button. The Mozilla Firefox will start a task to fix your problems that caused by the Pushmeandtouchme.info adware. Once, it is finished, click the “Finish” button. The ad supported software can hide its components which are difficult for you to find out and delete completely. 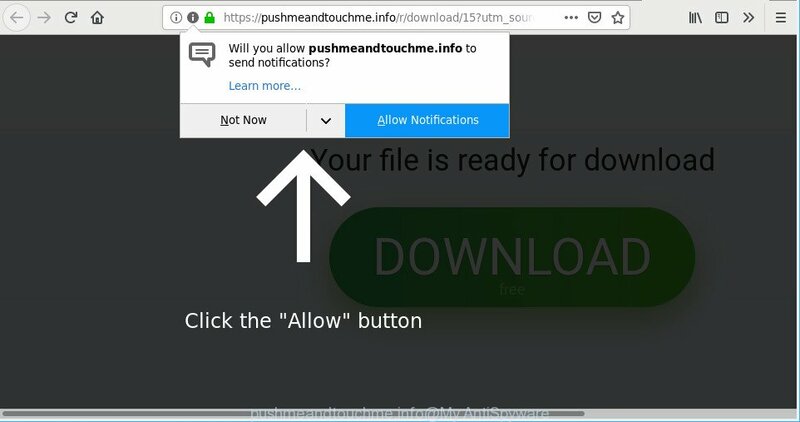 This can lead to the fact that after some time, the adware related to Pushmeandtouchme.info pop-up advertisements again infect your PC system. Moreover, We want to note that it’s not always safe to delete adware manually, if you don’t have much experience in setting up and configuring the MS Windows operating system. The best way to detect and get rid of ad supported software is to run free malicious software removal apps. Zemana Anti-Malware (ZAM) is free full featured malware removal utility. It can scan your files and Windows registry in real-time. Zemana Anti Malware can help to get rid of Pushmeandtouchme.info pop-ups, other PUPs, malware and adware. It uses 1% of your PC system resources. This utility has got simple and beautiful interface and at the same time best possible protection for your PC system. Click the following link to download Zemana Anti-Malware installer named Zemana.AntiMalware.Setup on your PC system. Save it directly to your MS Windows Desktop. Start the install package after it has been downloaded successfully and then follow the prompts to setup this tool on your personal computer. 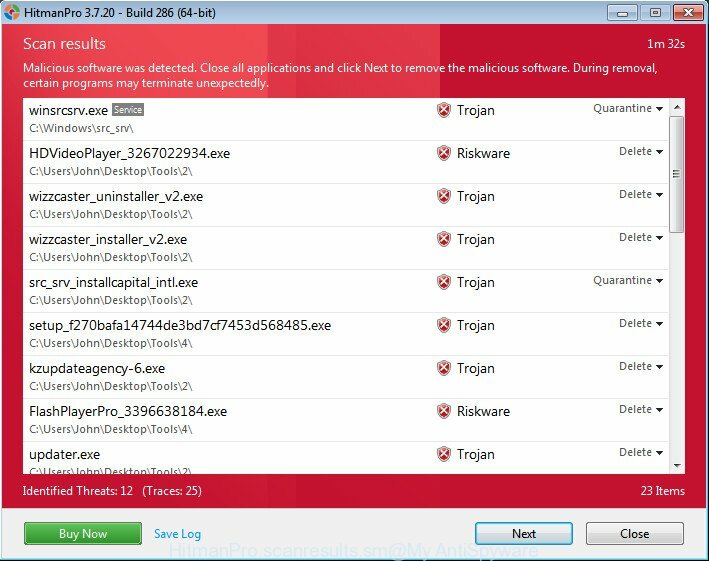 When installation is complete, this malware removal utility will automatically start and update itself. You will see its main window as displayed on the screen below. Now click the “Scan” button for checking your computer for the adware that causes intrusive Pushmeandtouchme.info pop ups. A system scan can take anywhere from 5 to 30 minutes, depending on your personal computer. While the Zemana Anti Malware (ZAM) utility is scanning, you can see number of objects it has identified as being infected by malware. After Zemana AntiMalware has completed scanning, you will be opened the list of all detected threats on your system. All detected items will be marked. You can remove them all by simply press “Next” button. The Zemana will get rid of ad supported software responsible for redirections to Pushmeandtouchme.info and move items to the program’s quarantine. After the task is finished, you can be prompted to reboot your personal computer to make the change take effect. The HitmanPro utility is free (30 day trial) and easy to use. It can check and remove malicious software, PUPs and ad-supported software in Firefox, MS Edge, Google Chrome and Internet Explorer internet browsers and thereby get rid of all annoying Pushmeandtouchme.info popup ads. Hitman Pro is powerful enough to find and delete malicious registry entries and files that are hidden on the PC system. Double click the Hitman Pro desktop icon. Once the utility is started, you will see a screen as on the image below. Further, press “Next” button to detect adware responsible for redirecting your internet browser to Pushmeandtouchme.info web site. This process may take some time, so please be patient. Once the scan get completed, Hitman Pro will show a list of all threats detected by the scan as shown on the image below. Make sure all items have ‘checkmark’ and press “Next” button. It will open a prompt, click the “Activate free license” button. Trying to delete Pushmeandtouchme.info redirect can become a battle of wills between the adware infection and you. MalwareBytes can be a powerful ally, removing most of today’s ad supported software, malicious software and PUPs with ease. Here’s how to use MalwareBytes Anti-Malware (MBAM) will help you win. Installing the MalwareBytes AntiMalware (MBAM) is simple. First you’ll need to download MalwareBytes Anti Malware (MBAM) from the link below. After the download is finished, close all software and windows on your machine. Double-click the setup file called mb3-setup. If the “User Account Control” dialog box pops up as shown below, click the “Yes” button. It will open the “Setup wizard” which will help you setup MalwareBytes Free on your computer. Follow the prompts and don’t make any changes to default settings. Once setup is done successfully, press Finish button. MalwareBytes will automatically start and you can see its main screen as on the image below. Now click the “Scan Now” button . 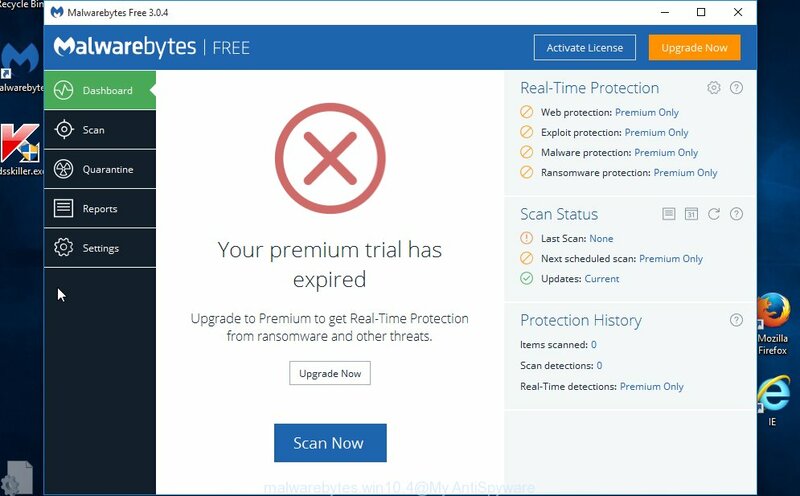 MalwareBytes tool will start scanning the whole computer to find out ad supported software that causes a large number of unwanted Pushmeandtouchme.info pop-up advertisements. A scan can take anywhere from 10 to 30 minutes, depending on the count of files on your computer and the speed of your computer. While the tool is checking, you may see number of objects and files has already scanned. 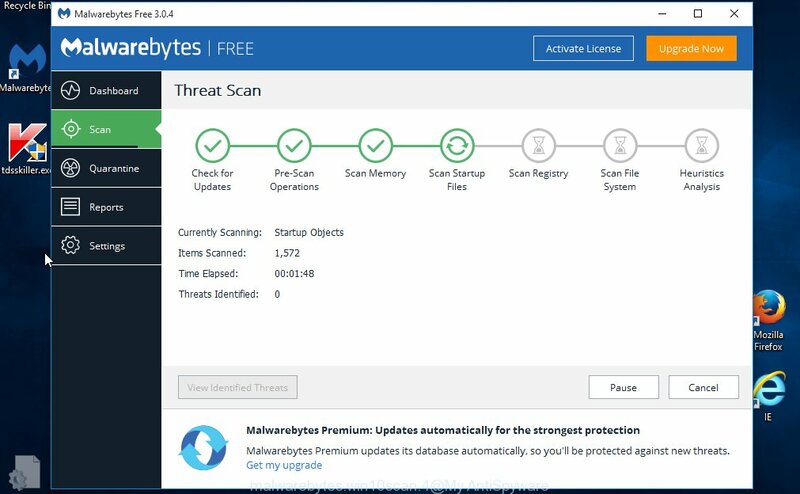 Once the system scan is complete, MalwareBytes Free will display you the results. All detected threats will be marked. You can remove them all by simply click “Quarantine Selected” button. The MalwareBytes Anti Malware will start to delete adware which causes unwanted Pushmeandtouchme.info advertisements. Once disinfection is done, you may be prompted to restart the machine. We recommend you look at the following video, which completely explains the process of using the MalwareBytes Free to remove adware, browser hijacker infection and other malicious software. If you want to remove unwanted advertisements, internet browser redirections and pop-ups, then install an ad blocking program like AdGuard. It can block Pushmeandtouchme.info, ads, pop ups and block sites from tracking your online activities when using the Chrome, Microsoft Edge, Mozilla Firefox and Microsoft Internet Explorer. So, if you like surf the World Wide Web, but you don’t like annoying ads and want to protect your computer from malicious webpages, then the AdGuard is your best choice. In most cases, the default settings are enough and you don’t need to change anything. Each time, when you start your system, AdGuard will start automatically and block popup ads, websites such as Pushmeandtouchme.info, as well as other harmful or misleading web-sites. For an overview of all the features of the program, or to change its settings you can simply double-click on the AdGuard icon, that is located on your desktop. After completing the step-by-step tutorial above, your PC system should be clean from adware responsible for redirections to Pushmeandtouchme.info and other malware. The Edge, Firefox, IE and Google Chrome will no longer redirect you to various intrusive web-pages like Pushmeandtouchme.info. Unfortunately, if the few simple steps does not help you, then you have caught a new ad supported software, and then the best way – ask for help here.